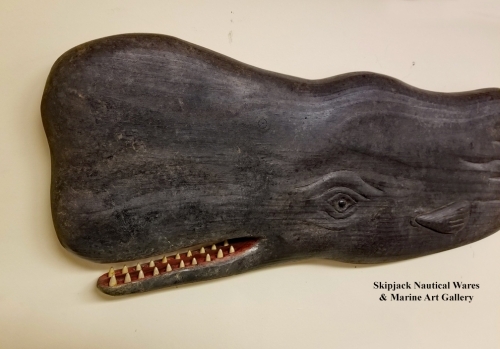 New England marine folk artist John Shaw carves in a traditional rustic folk art style similar in composition to carvings created during the early days of whaling. Each whale is hand-carved and painted in a style that replicates an antique example. John's carvings are created using native white pine and finished in acrylic paint and sealed both front and back with spar varnish urethane for durability. John Shaw is a native of Plymouth, Massachusetts and a direct descendant of the pilgrims. He has been carving and painting for over 30 years with a focus on wildlife. Custom carvings may be commissioned.